Every state has its own claim to fame. Arizona has the Grand Canyon, Florida has Disney World, and Wisconsin has... cheese? But which one has earned the bragging rights to say it purchases more booze than any other? The answer to that question is much clearer now thanks to a new series of maps that reveal which states buy the most beer, wine, and liquor in the country. 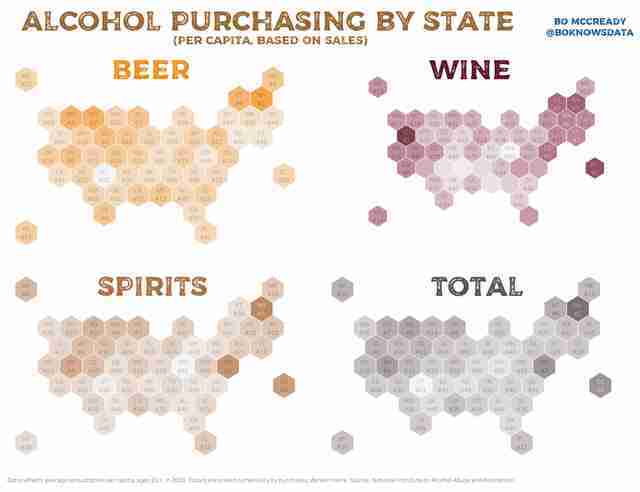 To figure out which states are selling the most booze per capita, data whiz Bo McCready looked at stats collected by the National Institute on Alcohol Abuse and Alcoholism and arranged them accordingly in an interactive map, revealing where each state stands in terms of beer, wine, and spirits sales individually, as well as overall alcohol sales. The findings are telling, and suggest that tastes and preference do differ pretty significantly depending on location. In terms of overall sales, New Hampshire tops the list (it's also number one in terms of beer and spirits sales, and number three for wine). The number two and three positions vary pretty widely, though Washington, DC and Delaware take those spots respectively for overall sales. You can scope out all the interactive maps here, but these are the top 10 states that purchase the most booze overall. 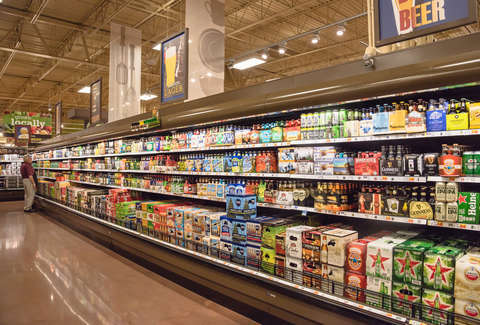 While people in New Hampshire may or may not be drinking more than enough alcohol for the rest of us, it's worth mentioning that its liquor stores are famously state-run and tax-free, and thus very popular with out-of-staters. In fact, more than half of the state's liquor sales are credited to people who cross the border to buy it, according to Boston.com. In any case, who knew Idaho loved its wine so much?